You know this thing about Son of Zorn Games? 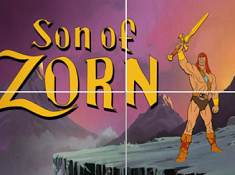 Son of Zorn Games is a new category appeared on our site where all you have to do is to focus all the time to understand the rules and to complete your goal successfully all the time to prove to everybody how good are you at these games. In Son of Zorn Games you can find 1 games that we've published for these kids and childrens that are interested to play Son of Zorn Games, this game gategory have been created on 09.05.2017. These games with Son of Zorn Games have been voted 1 times and the avarage of vote is 5.00 stars. We advice you to play the last flash game from Son of Zorn Games, Son of Zorn Sliding Puzzle that have been published on 10.05.2017 06:00. Son of Zorn Sliding Puzzle its a part of Son of Zorn Games category and until now its played 443 times. Try it now on Cute-Games.com! If your like the Son of Zorn Sliding Puzzle game you can write a comment in the game page. Recommend this game to your friends if you like it! Find More About Son of Zorn Games! Son of Zorn Games is a new category appeared in exclusivity on our site where you will get a lot of challenges, for girls and boys. The category is inspired from a new FOX animated television series. If you are a big fan of the series I am sure you will enjoy the games because you have the chance to interact closer with your favorite heroes. If you do not know about the animated television series you have the chance to meet new interesting characters like Zorn, his son, Alan and his wife. THese are only the main characters but you will see a lot of more character here in this category. After you play a few games from Son of Zorn Games category I am sure you will be curious to watch the animated television series with Zorn. The Son of Zorn Games is going to be updated if we see that you like these games. The Son of Zorn Games is going to bring you in the first place a sliding puzzle games for boys and girls where you have to do your best to solve three puzzles. You can chose with which you want to start, the number of pieces, if the pieces are going to be numbered and so on. I am sure you can make a great job in this game if you focus, if you prove that you have agility and attention. Let me tell you the story of Son of zorn, the new FOX animated television series. Zorn is a barbarian who is living in a fictional Pacific island called Zephyria. He is going to move in California to reconnect with his ex-wife and his son, Alan. It seems that only Zorn and the things that are related to his land, Zephyria, are animated in this series, the rest is live action. I think you will enjoy the show and you will appreciate our team who brought you this category with Son of zorn. Edie Bennett is now the name of Zorn`s ex wife who is married with Craig Ross, an online college professor. Zorn finds a way to get a job in the Orange County and his boss now is Linda Orvend. He is going to work at Sanitation Solutions as a phone salesman. He was the protector of his land and he had to fight with monsters, aliens, vampires and so on. Give us a like if you had fun with Zorn in these games and we will bring you more. Leave us a comment to tell us which was your favorite character in this category and tell us if you want also other games. A g plus is going to help us promote this Son of Zorn Games category for all the kids who love this new animated television series. In the puzzle game you have to use the mouse to slide the pieces. This is a sliding puzzle game and I am sure you will do your best to solve the puzzle fast. If you solve them fast you will get a chance to reach the podium where are only the best of the best. In this category is important to focus all the time, to pay attention at the indications and to be persistent because only in this way you can complete your goal successfully every time. Zorn trusts your skills so do your best to prove him that he was right and you are the right guy to complete all the games. Son of Zorn Games category is going to be on your taste, I am sure of that, because we have for you all kind of games for all the kids, both boys and girls. I am going to let you know if there will appear more games with Son of Zorn but until then we have ten new games every day for you on our site, the best games site in the country. Zorn and his son are going to try to be together again, to do things like father and son, because they have lost a lot of years apart. Alan is a little bit upset with his father but he is going to forgive him after he hears that he had to protect the magical land of Zephyria from all the treats. The barbarian is going to learn a lot from his son, how to behave in the city, what to wear and so on. I am sure you will have fun watching the series and you will be impatient to get more games in this category to have the chance to be closer with your heroes. Read the description of the games if you do not understand from the indications what you have to do to complete your goal in these games with Zorn and his family. Our team is there with you all the time.